September 11th will always be a special day in my life as it became my wedding day in 1993. This year would have been our 20th Anniversary. I was not a member of MATF-1 at that time and was recruited by Paul Carey 2 years later as the US&R System was expanding its WMD and haz-mat capabilities. On that day, like many of us it seems, I was on my way to a meeting in Augusta to work on finalizing safety rules and regulations for firefighters. There was a brief blurb on the radio about a plane striking one of the Twin Towers. I was scrolling through the dial trying to find out more when word of a second plane hitting a tower was broadcast. It still wasn’t clear what actually happened but as I entered the meeting room, nobody else had heard anything. Someone went to get a TV brought into the room and as it was coming on the 1st Tower was collapsing. Then word was spread about the attack on the Pentagon, the plane missing over Pennsylvania and also a report of a gunman at One City Center in Portland. This was later found to be false but it was the unanimous decision that we all had work to do and get back to our cities and towns. I thought about the only 2 members of MATF-1 that I knew at the time; Paul Carey and Mike Clarke and prayed for their safety. I also thought about the many members of FDNY I had met over the years and some of my good friends and hoped they were ok. Within a day or two I did find out my friends were all safe. They had not been on duty that day. After MATF-1 returned, I remember driving around Boston aimlessly with my wife as I was talking with Paul Carey about the experience; we had many mutual acquaintances from FDNY who were killed. The conversation was therapeutic for both of us except for Donna who had no idea where we were going as we wandered around the streets of Boston. As the first round of funerals began to take place I went down with another Portland fireman and we stayed at the quarters of Rescue 5 and Division 8 in Staten Island. We were asked if we wanted to go to “The Pile” for the shift change of the battalion chiefs. We of course said yes and as we began approaching the command post it was hard to fathom the devastation and wreckage still out on the streets blocks away from the Towers. We were told we could wander around and would be leaving in about a half an hour. What was so striking is that despite the mass of humanity and machinery working on the pile; cranes, generators, trucks, lighting plants, iron workers etc all working full speed, there was an eerie sense of quiet. It was as though the departed souls worked together to muffle the sounds and remind us all this was now a graveyard. On that tragic day, while some of the most evil displayed the very worst of humanity, the selfless and brave souls of FDNY exemplified the very best of humanity! While I was not a member of MATF-1 on September 11, 2001, I was proud to participate in the brief memorial service we conducted at Liberty Park in New Jersey on September 11, 2008 as we returned from the hurricane deployments. I think of the many pictures we have at the Cache, one of the most symbolic is the one with the members who deployed to the WTC assembled at that 2008 service. Thank you for the opportunity to serve in this proud and dedicated organization and for keeping the memory of that tragic day in our hearts and minds. 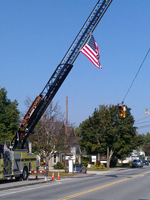 I have attached a picture from the small town of New London, New Hampshire that reinforces Always Remember, Never Forget! John Cannon, Hazardous Materials Specialist.